Ovation Deacon - or is it a Breadwinner? Submitted by glw on Fri, 09/29/2006 - 20:27. As I've commented on here before, I've been looking for one of these vintage 1970s solid-body Ovations for a little while now (see my "Guitars you secretly lust after" thread), and I finally tracked down this beauty for a very nice price. It was sold to me as being an Ovation Deacon but I'm not quite sure. The Deacon was the "posher" version of the Breadwinner and generally had a natural finish, bound fingerboard and "double diamond" inlays on the fingerboard. Now, whilst my guitar (pictured above) has the smaller scratchplate that adorned most Deacons, it doesn't have the bound fingerboard, diamond inlays, and is a solid black in colour. My inclination is that it's a Breadwinner with the smaller scratchplate, but I'm not 100% on this. Any Ovation fans out there? Does anyone have any more info for me? Posted by glw on Sun, 10/01/2006 - 10:11. OK... the guys over at The Ovation Fan Club - http://www.ovationfanclub.com/ - are pretty insistent that it is a Breadwinner, albeit a bit of an unusual one. It looks like they may have mixed and matched parts at the factory. Posted by pedalboardguy on Tue, 10/17/2006 - 02:13. I bought a Breadwinner new in 1974. 275.00USD with a hardshell case. I knew nothing about electric guitars. Anywho.. I bought it simply because I owned an Ovation acoustic and it seemed like the proper next step. I'm not sure where the body and electronics got off to, but I still have the 24 fret neck. It's hanging on the wall, here in my office. How in the world could I have let the neck, body and case become seperated? My friend owns a CNC machine (uses a computer to cut wood, ie..guitar body) We've been talking about building a body for this Breadwinner neck. If we actually do it I'll post a pic. I'm not sure what body style would work best, but I am a strat guy. Posted by glw on Tue, 10/17/2006 - 08:58. It ought to become a Breadwinner again! You can't give it a Strat-style body - that would be an almighty cop-out. 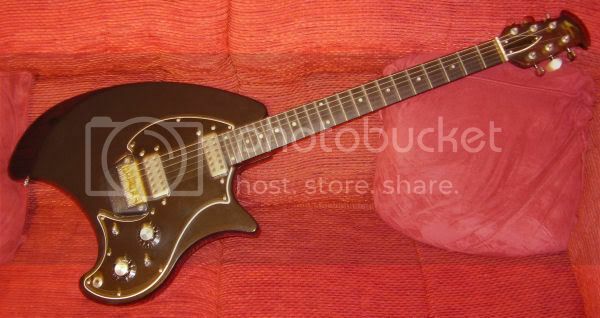 Keep checking ebay for parts... there's been a whole bunch of Ovation solid body parts recently. Posted by 1bassleft on Wed, 10/18/2006 - 00:38. Nice to see you back, pbGuy. There was a thread here on FX rigs and I wondered aloud if you'd be chiming in. How's the business? Posted by Michael on Wed, 10/18/2006 - 00:42. I'm with GL, it has to be a Breadwinner. Your gonna regret stratting it up afterwards... a breadwinner will leave you feeling all warm inside. It's like restoring a classic car to its original state. Posted by pedalboardguy on Fri, 10/20/2006 - 05:59.
business is steady. thanks for asking! Posted by mrblanche on Fri, 10/20/2006 - 11:01. The "mix and match" factory habit can produce some great things. Ibanez has done that a number of times, using up leftover parts, and those guitars fetch a pretty penny. Another thing Ibanez has done is to bring guitars over from Japan for a show, then disposed of them to local dealers so as not to have to carry them back. I've seen photos of a few of those, and some are fantastic machines, handmade...and not in any catalog anywhere.